A trip to the circus awaits those brave enough to face the wild animals and creepy clowns underneath the big top. 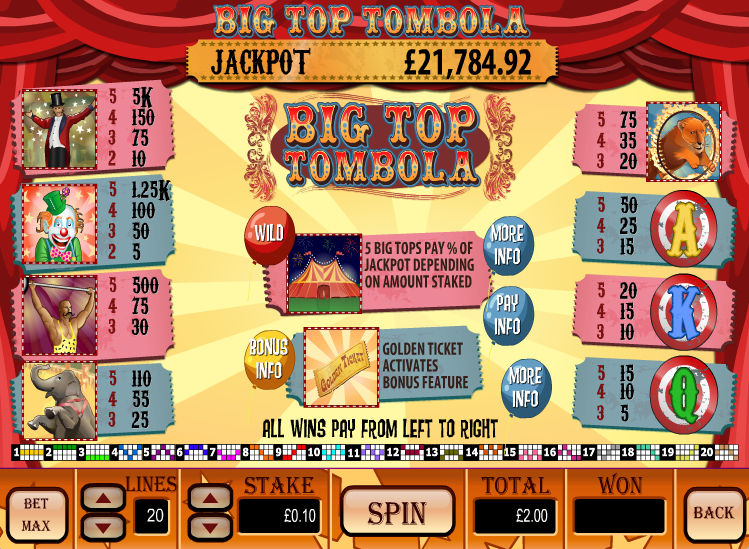 The title of this online slot is Big Top Tombola and it’s developed by Playtech/Virtue Fusion – it includes not only a circus-themed bonus feature but also a progressive jackpot at which to aim so read our review below for more information. 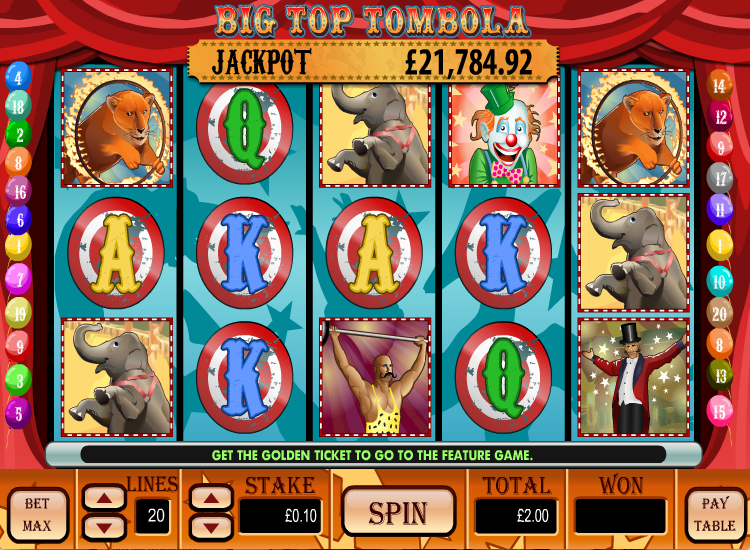 Big Top Tombola is a five reel slot with three rows and up to twenty paylines; everything takes place inside the reddish canvas interior and it’s immediately noticeable that pressing certain buttons will emit the noise of a clown’s hooter. The progressive jackpot total is listed above the reels and balloons mark the paylines on either side of the reels. There are four circus-themed high value symbols including a dancing elephant, a strongman, a clown, a lion and the ringmaster; Q, K and A make up the lower values. The big top itself is the wild symbol and substitutes for all other symbols; the Golden Ticket icon is the bonus symbol which only appears on the first reel. This mini-game is triggered by landing the Golden Ticket icon on an active payline on reel one; you will now be shown a spinning tombola and all you have to do is tell the ringmaster when to stop it. This will reveal a raffle ticket displaying a multiplier value which will be applied to your line stake and the number of winning paylines the bonus symbol is on. The big bucks are won by landing five of the big top wild symbol on an active payline but it’s important to note that your share of the prize is dependent on your stake per line. To be eligible for the full amount you must be betting £5 per line (but you can use just one line) and the percentage of the jackpot prize gets proportionately smaller as your line stake decreases. For example wagering £0.01 per line will win you 0.2% of the jackpot. The jackpot total you see is already adjusted based on your stake. As stated above if you want a shot at the big bucks you need to be playing £5.00 per line; there’s also an incentive to play more paylines because the Golden Ticket will have a greater chance of triggering. A minimum of £5.00 per line does sound a bit steep to qualify for the entire jackpot but generally we like this game; it’s graphics are of a high quality and the music is appropriate. The RTP is a little low at 93.00%.